We go way back with Hannah – all the way back to Jamie’s long lost pageant days! Hannah’s best friend was involved in the system, and she came to all of the competitions, so we got to know her that way. But before then, Jamie followed Hannah on Twitter and loved laughing at her witty commentary. And now, we regularly work with Hannah on wedding days! Hannah, or Big Haired Hannah, as many know her, is an incredible hair and makeup artist, and she’s made so many of our brides look beautiful! When Hannah and Parker got together, we were so happy that they found each other. Hannah deserves nothing but the best, and we know that’s what Parker is to Hannah! These two are so cute together – check out all of the cuteness below! We are so honored that our team is a part of Hannah and Parker’s big day! It’s always such an honor when a fellow wedding vendor asks us to photograph their wedding day, and we know that our associate photographer, Maggie, will do a beautiful job! 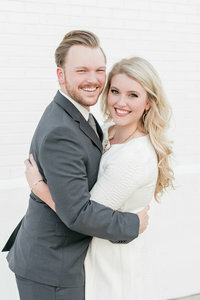 These two are tying the knot at Church of the Highlands and then their reception will follow at Sloss Furnaces. It’s going to be incredible! !